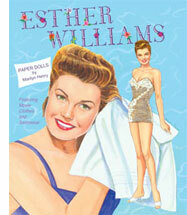 Bringing beauty and glamour from the big screen to the paper doll book is a specialty of Marilyn Henry’s. Her childhood was filled with movie-going and playing paper dolls, and if a paper doll of a favorite star didn't exist, she would draw one for herself. Getting a good likeness was always a top priority, and that carries on to her work today. It is one of her strengths as a portrait artist. 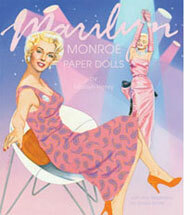 As a girl, Marilyn and her best friend Margie created an elaborate world for their paper dolls in their own version of Hollywood called “Twinkletown.” The girls drew glamorous wardrobes and made up movies for their paper doll stars, and Marilyn would write about them in her hand-made movie magazine, Screen Fiction. It was all in fun, but it led Marilyn to a creative future. After a successful career as a fashion illustrator, writer, designer, and college art instructor, Marilyn turned her focus back to her childhood love of paper dolls. Her first published book was Vivien Leigh, for Merrill Publishing in 1979, and since then she’s created dozens of movie star paper dolls for books, magazines and convention souvenirs. In the 1970s Marilyn introduced and discussed old movies on a TV show, “Superstar Movies,” for her local public TV station in Evansville, IN. Tapping into her knowledge and love of old movies, she wrote a book about a favorite star, Alan Ladd, in The Films of Alan Ladd, published in 1981 by Citadel Press. And later, she interviewed and wrote about the stars of daytime TV for various Soap Opera magazines. During the 1990s she created a lovely line of paper dolls for B. Shackman & Co. illustrated in the style of the 1940s books she had loved so well. Her series includes Joan Crawford, Barbara Stanwyck, Claudette Colbert, Myrna Loy, Lana Turner, Carmen Miranda, and a paper doll version of Mel Odom’s Gene Doll™. Marilyn's celebration of the stars continues today as editor and art director of Paperdoll Review, a specialty magazine about the nostalgia of paper dolls. And now working with Paper Studio Press, she is creating new paper doll books, capturing the fashions, glamour and beauty of Hollywood legends including Marilyn Monroe, Ginger Rogers, Esther Williams, Leslie Caron, Jane Powell, Loretta Young and Joan Fontaine.